In POS, there is no need to configure a credit card receipt printer because these receipts print on the printer defined in the POS Terminal Record. Your Vantiv credit card receipt printers, in Execu/Suite (the hotel software) must be defined. In the point of sale software, credit card receipts print to the terminal’s receipt printer and something similar must be set up in Execu/Suite. You’ll set up this printer using the “//” method, described in detail here: POS Printer Setup. When operating in a Remote Desktop environment, don’t use “session” or “redirected” printers. These are auto generated printers and not suited to an environment needing static printer direction. You MUST add this printer to this user's 'Printers and Faxes' list in their Remote Desktop environment. The printer must be accessible from EVERY TERMINAL that needs to print to it. It must be accessible via the same name as specified in the settings. If the same printer is configured with different names on different computers, you will need to create separate terminal records for each terminal so that the printer can be properly set for each terminal. At the bottom of this page you will find details on setting the terminal ranges. If you're using the older 'Push Button' menu, where all menu items are displayed in a box in the center of the application, you use a different method to access the Program Name prompt. At the Master Menu, type the number 88 and then press Enter. After selecting this option you'll see a small window with a field to type a program name. This is where you type "MENUEPCO". Click OK and when presented with the "Select Printer" menu, press the Enter key. Select the Terminals tab. Double-click the cell in the Printer column that corresponds to your terminal. This will highlight the text of an existing printer. If no printer name is there, you can type one, beginning with "//". You can right click the printer name to see which Windows printer is currently selected. Picking the printer name is important. If you have the preferred printer, the Epson TM-T88 or newer (most newer Epson thermal receipt printers are compatible) then the printer device name should be //TMT88. If you have multiple TMT88 printers they must all have a unique name, so name them something easy like //TMT88-1, //TMT88-2, etc. If the printer isn’t Epson compatible, the name can be any of your choosing. Description This is a short description of this terminal range. Printer This is the field where you name and select the printer for this terminal range. This is where you use the "//" printer selection method. Resv AcctID This is the 'Reservations' merchant ID and applies to all credit card transactions in Advance Deposits. Hotel AcctID This is the 'Hotel' merchant ID and applies to all credit card transactions in Front Desk. POS AcctID This is the 'Point of Sale' merchant ID and applies to all credit card transactions in Point of Sale. A/R AcctID This is the 'Accounts Receivable' merchant ID and applies to all credit card transactions in Accounts Receivable / Direct Bill. TriPOS? If EMV PIN Pads are used for this terminal range, enter "Y". After highlighting the printer name or entering a new one, press the Enter key. You'll see the Windows Printer Setup box. Select the printer. Never click Network to select a printer. The printer must already be set up on the computer and selectable from the Name dropdown box. After selecting the printer, click OK. You'll see a box confirming the printer that was selected. To verify the printer that is selected for a terminal range, RIGHT-CLICK the name in the "Printer" column. 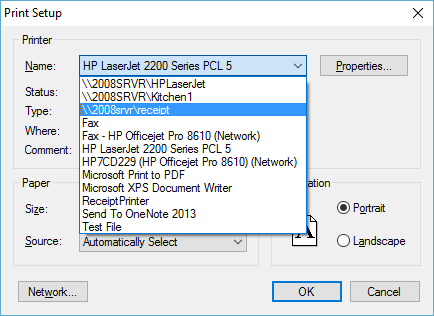 If you use the method to select another printer, the printer that you see in the printer dialog box may not be correct because we have no control over the printers shown in this list. The terminal range is the Beginning Terminal through the Ending Terminal. The terminal range serves two primary functions. Defines the printer on which the credit card receipts for these terminals will print. Defines the Merchant IDs that the terminals will use. It's best to define a blanket range, from 001 to 099, with the default Merchant IDs for each category. This ensures that any new terminals added will at least be able to process credit cards. This range should be placed on the first row. Any redefined terminal ranges will override any above it. For Point of Sale terminals, the printer setting doesn't matter because these terminals will print the credit card receipt to the receipt printer that's defined in the Point of Sale Terminal Record. See POS Printer Setup. 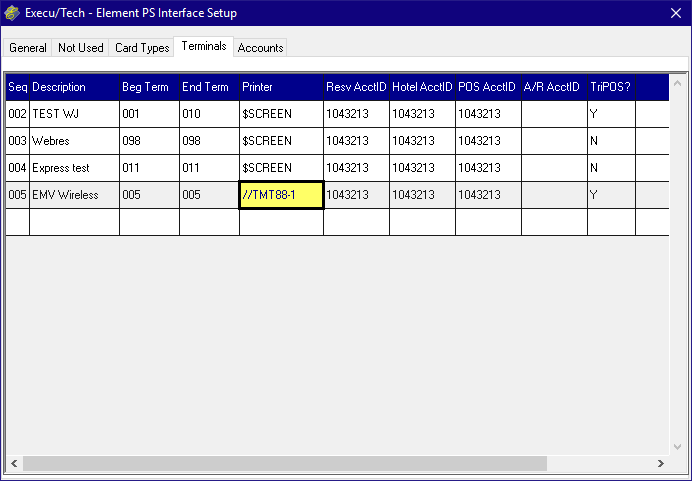 Because of this, Point of Sale terminal ranges only need to be grouped by terminals using the same Merchant ID. If your terminal numbers are spread out and not concurrent, you can use a blanket range that include the full range of the terminal numbers, then, below this line, redefine and terminal numbers that don't fit in to this range. If your terminals use the same Merchant IDs but different printers, these terminal ranges will need to be defined separately, because only one printer can be defined per terminal range.